Bentley: “Hello and welcome to BFTB NETWoof News. We have fetched some feel-good stories for you today. 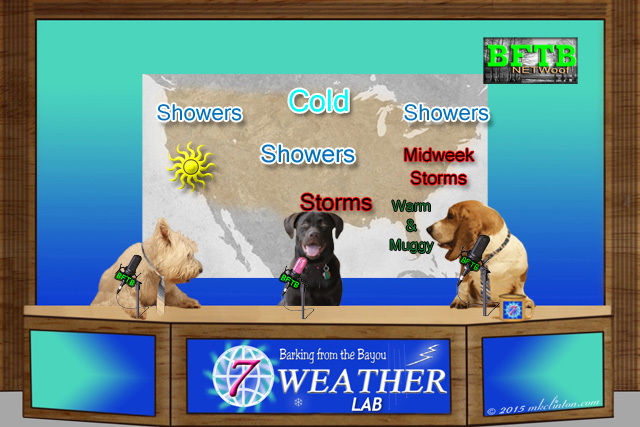 I am joined at the news desk by Pierre the Westie and our Weather Lab, Paisley. Let’s get straight to our top story. Bentley: “All righty then. I think I’ll just stick to smelling people to decide if I want to be their friend. Speaking of friends, a Great Pyrenees was spotted on the side of a road in Dallas standing guard over his friend who had been struck by a car. The big dog had drug the injured dog out of traffic. A rescue worker was able to load both dogs into her vehicle and take them to a local veterinarian. Sadly, the friend didn’t survive its injuries, but the Pyr is now available for adoption at SPIN Rescue in the Dallas metro area. Pierre: “I hope someone rescues that sweet heroic fellow. We have another hero in today’s report and it is a little Dachshund named Tosya. It all started when a black bear attacked a child in a small Russian village. His buddy threw a rock at the bear and hit it in the head. The bear then turned its attention on that child. Rushing in to save the day was Tosya who began barking furiously at the bear. It was at that point the bear stopped biting the second child and gave chase to the brave Doxie. Almost as if it knew exactly what to do, Toysa led the bear back to the woods before giving it the slip and returning to the village as a hero! Great news, pals! We heard about that rescue in Ohio too and were so shocked and HAPPY that every single pet got a new forever home. Unbelievable...in the best way possible. Great news coverage as always! 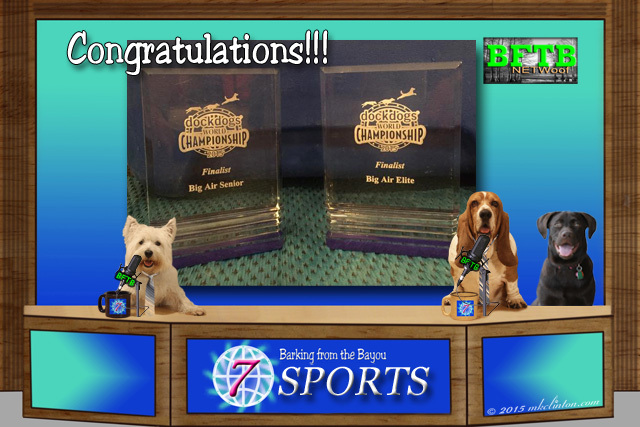 Thanks so much for sharing our World Chanpionship results!! And happy birthday to that cutie patootie, Paisley !!!!!! Paisley could you spread those storms around a little better. Sunny and warm is not what we want when we are in a drought. Wow! Such great news today!!!! All pets? I mean, just wow! I love these stories. That pup who stood guard over his friend. Oh my goodness. Pups are the best!! Happy birthday Paisley! Thanks to you all for another great news week coverage!! We've already looked up Bark & Borrow! I should have baked a cake for Paisley's birthday, but I forgot. We are in the rain up here, great napping weather! Wow, you guys turned up some great stories this week, I don't think we'd heard any of those. All that talk of cake has made us hungry though! Yay for the Liver Killers...they did great! Great job on the news. We hope you all got some cake for Paisley's birthday. What a pawsome news day!! Empty shelters are the best kind!! Great reports, especially that hero dog Toysa and the shelter in Akron. Great story about the Great Pyrenees, that was my favorite topic today! That is one loyal pooch. Happy Birthday Paisley hope you have many many more!